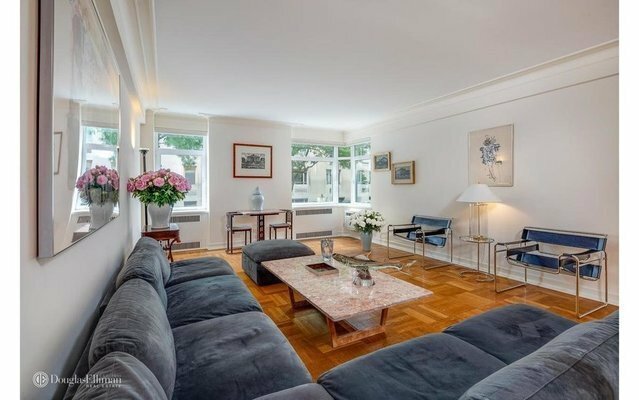 This apartment is perfectly located across Central Park at 69th Street. The home enjoys townhouse and side park views and is sun filled. An impressive entry gallery separates a corner living room with north, west and east exposures, from a large dining room creating a 41' expanse. The oversized master suite features two walk-in custom closets and a luxurious windowed bath with a large shower. The south facing second bedroom has generous closets and a beautiful bathroom which can double as a guest bath. The staff room/home office also has an en-suite bath. Features include: high ceilings and hidden alcove lighting. Pied -a-terre is permitted with board approval. 875 Fifth Avenue is an art deco, white glove cooperative completed in 1940 and has a fantastic gym , brand new lobby lounge, business center, additional private storage and excellent staff which includes full time doorman and attended elevators.Washer/dryers permitted.